For more years than I really want to think about, I have been looking into ways to use samples as the raw material for synthesis. Having spent my formative years during the rise of S&S (Sample and Synthesis (processing)), and with the E-mu Morpheus as one of my all-time favourite synths (or more correctly, sample replay devices with synthesiser-style post processing - and in the case of the Morpheus (and a few other favoured E-mu devices), that wonderful morphing Z-Plane filter! ), then my aim has been to see just how far samples can be exploited in a synthesis context. Demo video. First, here’s the 'teaser' ‘demonstration’ video that shows some of the results - using a single sample of an aluminium can (‘tin can’ is much shorter and easier to type, even though the metal is not tin!). This does not go into the theory or practice in much depth. AES@NAMM. 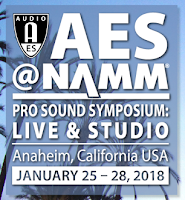 Here’s a link to the AES@NAMM web-site. 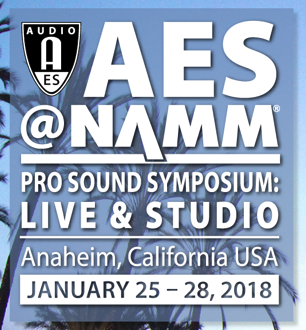 AES@NAMM Pro-Sound Symposium. This is a link to the event itself. 'Residuals Using Simple Separation' The link to the presentation schedule - it’s an AES ‘Engineering Brief’. 'Residuals Using Simple Separation - the paper'. The link to the paper itself. 'Residuals Using Simple Separation' Powerpoint. Here’s a link to the slides from the presentation, where I talk about some of the background theory (there's more in the paper), and do some demonstrations. I’m going to post some more detailed audio demonstrations on SoundCloud and Youtube later too. Coming soon. Here’s a link where you can download the Ableton Live Instrument Rack device that I used to do the demos in the video and the presentation. There’s lots of scope for a more intelligent front-end to doing this form of ‘synthesis using samples’. Coming soon. When I have tidied up the Nyqvist code for the sample processing routines that I used inside Audacity, then I will post a link to them as well. They are released using a GPL licence. There are also a lot of possibilities to make the required sample processing smarter and more automated, and I hope to see some cool stuff released that makes the most of the creative possibilities. I’m considering writing an M4L ‘assist ‘plug-in’, but I’m sure that a better coder than myself is going to beat me to it with something really cool and sophisticated. I’m working on a ‘user manual’ for the techniques that are described in the paper and presentation, and I’m more than happy to talk to sample library creators about how they can use the concepts to enhance the flexibility and usability of their samples.